"Illegal private salt makers, mostly women, in Yangzhou demolished the official salt-selling station in reaction to the government's intensifying effort to eradicate private salt sales. 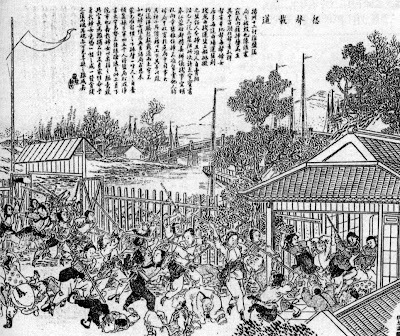 Source: Dianshizai Hubao, 1897." From Ho-Fung Hung's Protest with Chinese Characteristics: Demonstrations, Riots, and Petitions in the Mid-Qing Dynasty (New York: Columbia UP, 2011).